One of the best parts of capitalism is the idea of competition. Competition delivers us lower prices, higher quality, and more options. So what has our lord and savior capitalism delivered to us in the gun realm? The Remington Tac-14 ($420) is what. Sure enough, come late April Remington announced the Tac-14. The Tac-14 being the Remington 870 12 gauge firearm that’s totally not a shotgun and is a firearm. We are going to review the Tac-14 inside and out, how it functions, how to safely shoot it, and how exactly this thing is even legal. I know at least one person is really pumped about this, the owner of Shockwave Technologies. With the two biggest shotgun companies in the United States purchasing his grips for two incredibly popular firearms he’s gotta be pretty pumped. How is This Thing Legal? 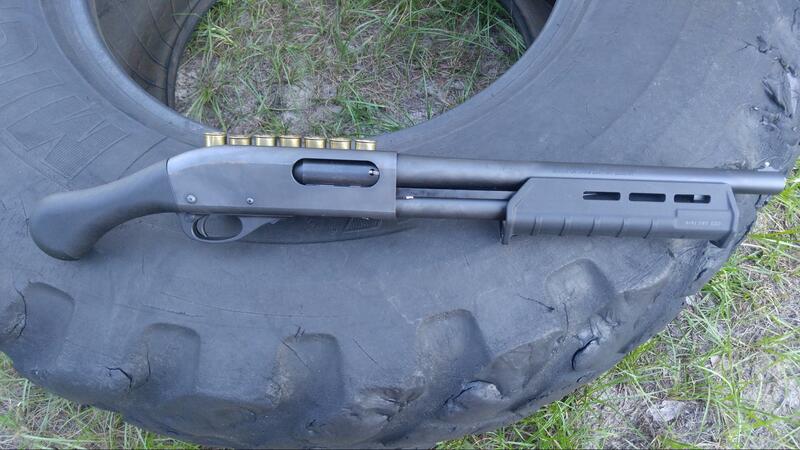 Federally these things are not considered short barreled shotguns, even though they have 14-inch barrels. I went a little deeper in my Mossberg Shockwave article, but basically, because these weapons have never had a stock, they are not shotguns. A shotgun by United States law is a weapon that’s designed or redesigned to be fired from the shoulder. If it’s never had a stock it’s not designed to be fired from the shoulder, and barrel lengths do not apply. What does apply is an overall length. The weapon must remain longer than 26 inches, or it becomes an AOW (Any Other Weapon). An AOW is like an SBS (Short Barreled Shotgun) and must be registered with the ATF, with a tax stamp, and a long waiting period. This is all Federal Law and doesn’t cover individual state laws. If you live in a State that Hates fun like California it’s likely illegal. Heck, in Texas this thing won’t be legal til September. So check your state laws before diving into the “not a shotgun” realm. Since this thing is legally not a shotgun I am going to avoid referring to it as a shotgun, but if I slip forgive me. First, let’s talk about the box. It’s freakin sweet. The box itself is just green cardboard, but the custom cut foam is a nice touch and I’m keeping it. Maybe I’ll shove it in a violin case and make a discreet carry case. 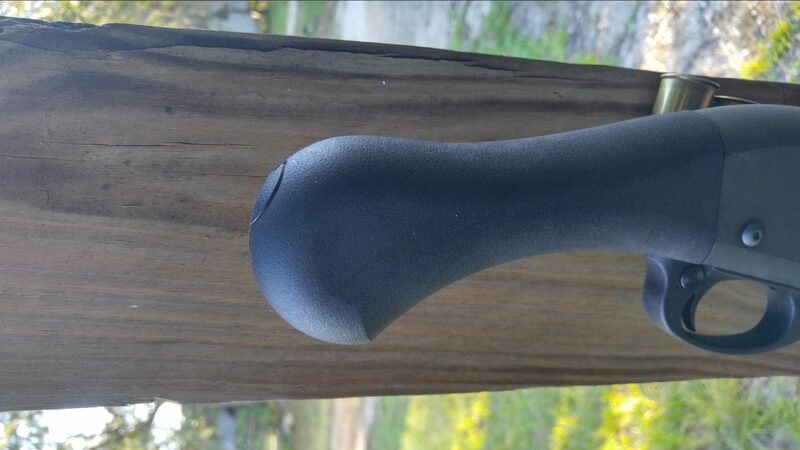 The finish on the Remington is quite impressive too. It’s nice and dark, thick and evenly applied. Surprising, since Remington has had an issue or two with finishes the past few years. The Tac 14 finish is reminiscent of my first gun, a 20-year-old Remington 870 Wingmaster. The pump glides backward, smooth and tight as if it was on ball bearings. There is no grit, or burs, start, or stops. The pump is actually a Magpul M-LOK pump. This is one of my favorite shotgun pumps due to the MOE and M-LOK attachment points. You can attach a variety of rails and accessories. I prefer the Magpul pump over a Picatinny rail equipped pump 12 gauge since: Recoil + Picatinny rail + Hand = Pain. 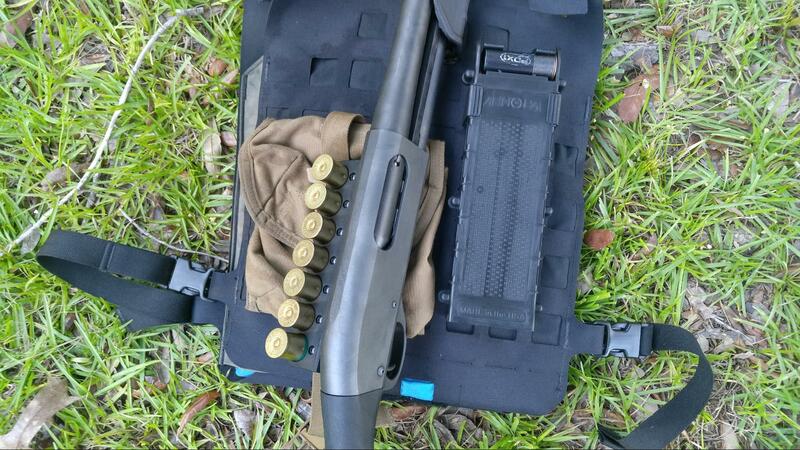 The Remington Tac 14 wears the bird’s head style Raptor grip. The Raptor grip is reminiscent of the Witness Protection shotguns used by the US Marshals and featured heavily in films like the Eraser and The Book of Eil. Shockwave Technologies brought the grip back to the mainstream. 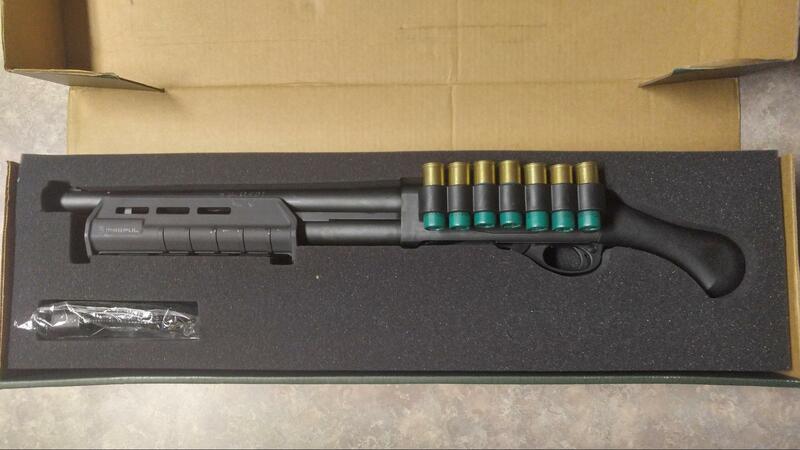 Without Shockwave creating the Raptor grip we wouldn’t have these 14-inch barrel 12 gauge firearms. The long horizontal nature of the grip allows the Tac 14 to remain over 26 inches with a 14-inch barrel. The meaty all steel receiver makes it a hefty beast. It’s not uncomfortably heavy, but its short size makes it surprise the first time you lift it up. You don’t just pick a gun like this up and start blasting away. Before we talk about booms let’s talk about safety. These are not good guns for beginners and can be dangerous if you don’t know what you’re doing. Let’s not lose any fingers over a 12 gauge am I right? Do you want your hand in front of that muzzle blast? That brings me to my first complaint. While I really love the Magpul SGA foregrip, I find it to be a bit too slick. With the short barrel and lack of a stock, you’ll be putting a lot of pressure to close the action which can cause your hand to slip. This is especially true when running the gun fast. If you are doing a pump, shoot, pump, shoot pattern then you need to be extra careful to make sure your hand doesn’t slip in front of the barrel. If you follow a pump, pause, shoot pattern you’ll be fine. I’m focusing on the negatives, so let’s look at why I like this gun. For one, it’s so much fun to shoot. You’d think the recoil, concussion, and blast would make it a bit brutal. That’s honestly what makes it fun. A 12 gauge in such a portable package is just fun. The challenge of controlling it, and shooting it is just thrilling. It’s no pussycat in the recoil department, but it’s not painful. 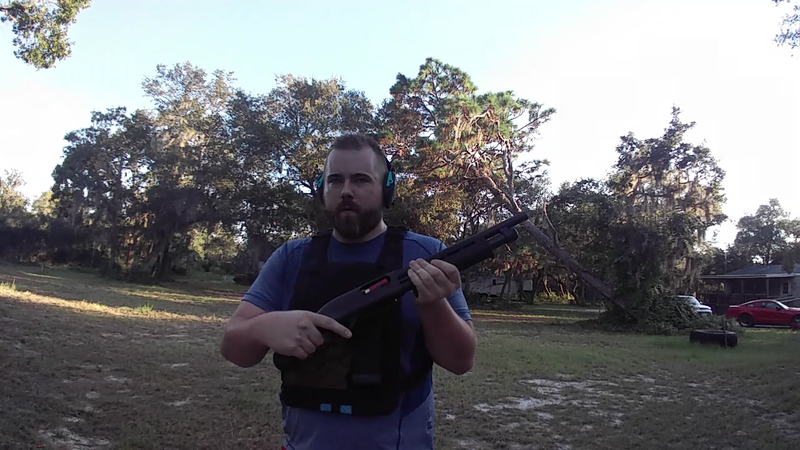 If you’ve fired a pistol grip only shotgun then you likely expect a bit of pain and discomfort. The Tac 14 is nowhere near as painful as a standard PGO shotgun. The Raptor grip makes it much more comfortable to shoot than a standard vertical grip. The recoil force doesn’t use and abuse your wrists, and it more or less pushes the recoil upwards than rearwards. A lot of people think a shorter barrel length equals a wider spread. This simply isn’t true, spread or pattern is determined by load and choke. The Tac 14 uses a standard cylinder choke and produces a pattern of about 7 inches at 15 yards using standard Federal 00 buckshot. We could talk about reliability, but it’s a pump action Remington 870, it’s hard not to be reliable. I haven’t had any issues with cycling and feeding even the cheapest buck and birdshot. My personal favorite round with these little monsters is Fiocchi low recoil buckshot. The Ergonomics of this gun are simple. The push-button safety is perfect for me but will frustrate the lefties out there. It is a little more difficult to reach with the Raptor grip, but not impossible. The pump release is easy to reach and press with the Shockwave grip for both lefties and righties. The trigger is very nice and smooth. It has a little uptake, and then it breaks. Overall the gun tosses shells aggressively and smoothly from the chamber with a satisfying shuck. So the first step in handle one of these shotguns is recognizing your own weaknesses. You need to be able to hold the gun with some authority and confidence. You want to extend your support arm till it’s nearly locked out. You push forward with your firing hand, and at the same time, you are pulling rearward with the support hand. This push/pull method will stabilize the weapon and help fight the force of the weapon and will give you a safer overall experience. Pulling rearward with the support hand will help ensure your hand has rearward momentum and keep you from tossing your hand in front of the barrel. Pushing forward with the support hand keeps the gun from coming rearwards into your face. To really keep the gun from coming backward you want to avoid putting the Raptor anywhere close to your face. Just be cognizant when aiming that you are pressing the shotgun forwards. If not you’ll get a bad case of 12 gauge nose. 12 gauge nose is what you get when you hold the gun a little too close to your face when you pull the trigger. It’s kind of like scope eye, but more embarrassing and painful. So what is the purpose of the Remington Tac 14? Like the Shockwave the purpose is very limited in nature. It’d be a good snake stick, but there are much better shotguns for home defense, hunting, and other standard tasks. The Tac 14 could be used for home defense, as it is a very small and a very powerful package, but it’s not as effective as a standard stocked 18.5-inch barreled shotgun. 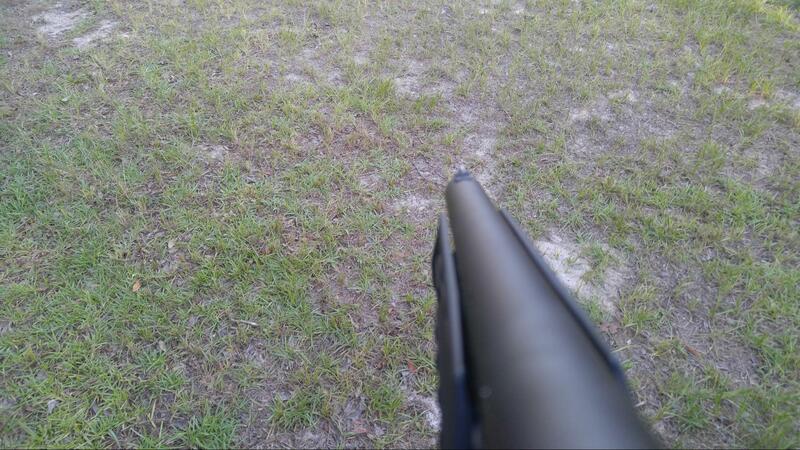 The recoil is much better handled by a stocked shotgun (like a normal Remington 870), especially for rapid follow-ups. If you are looking for a real home defense gun, read the Best Home Defense Gun guide. First and foremost I do have a complaint or two about the gun. I mean, of course, I would. The first one is that it lacks a rear sling swivel. It would so easy to add a sling point on the Raptor, ridiculously easy. It would then be the perfect gun for a single point sling. I guess I gotta fire up the drill and grab a sling swivel. I also think Remington should have drilled and tapped the receiver for a scope mount. True a scope is not necessary on such a gun, but a red dot, especially a miniature red dot is a fantastic addition to these style of firearms. My Shockwave wears one and it increased my effective range with the gun out to 35 yards with Aguila mini slugs. This was one a 21-inch tall popper, so I could probably make effective hits out to 50 yards on a man-sized target. 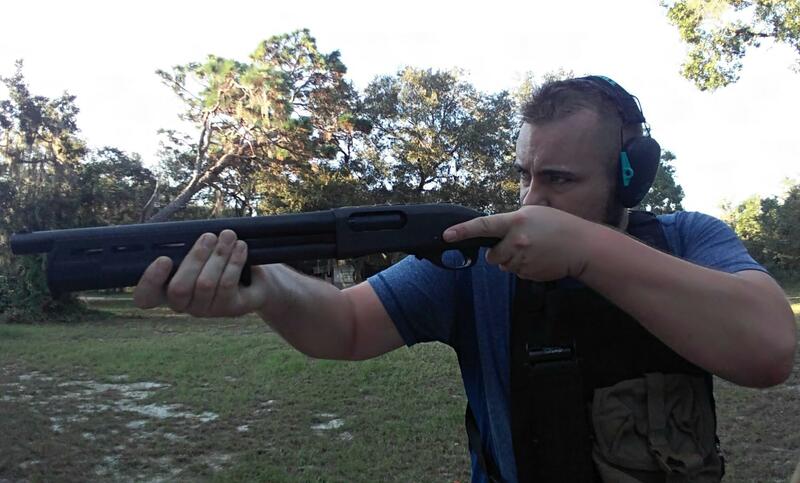 The Remington Tac 14 is a fantastic little…not a shotgun. Trying to control and shoot the Tac 14 provides a challenge and a dynamic thrill. It has also proven to be rock solid in terms of reliability. If you really want a fun little gun, or want to pretend to be a U.S. Marshal, and prefer Remington over Mossberg, then the Tac 14 is for you. If you want something practical, efficient, and as effective as an actual working gun then I’d consider a standard 870. If you’re looking for legitimate home defense, take a look at our 5 Best Home Defense Tactical Shotgun roundup. The Remington Tac 14 has its place, and it’s on the toybox side of the gun safe. Have a Tac-14? 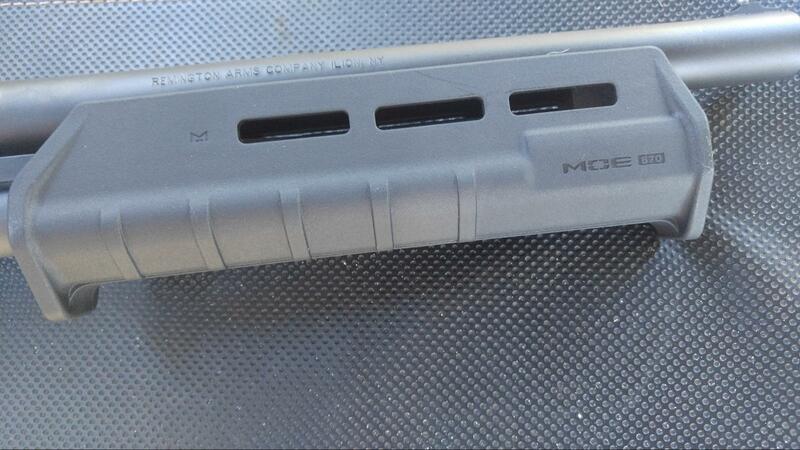 Mossberg Shockwave? Something else that is a “Not a shotgun”? Tell us about it in the comments! So the very first thing I did after buying a TAC-14 was order a handguard strap similar to what the Mossberg has as standard equipment. Got it from Amazon for around $16 and it went on the M-LOK fore end like a breeze. This setup gives you the opportunity to do a “push-pull” which significantly reduces recoil on your wrists. This will also limit my cringing when amateurs fire this beast. What brand was the hand guard? My wife just bought me one, I have been jonesing for one since they came out, my son, bless his heart, has endured years of gun stores , told my wife just what I wanted!!! I have no use what so ever for a not a shotgun, but damn I wanted one!!! !Now I……. uh my wife owns one!!! Can’t wait to shoot it! What kind of bullet loops are those? I noticed while reading How to handle a bucking bull (Pulling rearward with the support hand will help ensure your hand has rearward momentum and keep you from tossing your hand in front of the barrel.) & ( Pushing forward with the (support hand) keeps the gun from coming rearwards into your face. Should it have been pushing forward with the trigger hand as is said earlier in the same paragraph? So adding an arm brace to it still keeps it legal ? But NO stock !